Grace Thomas & Temperance Lloyd: "Why dost thou weep for me?" Temperance Lloyd was "the leader" of the Bideford witches. They were tried and hanged in 1682 in Exeter; the last people to be executed for witchcraft in England. 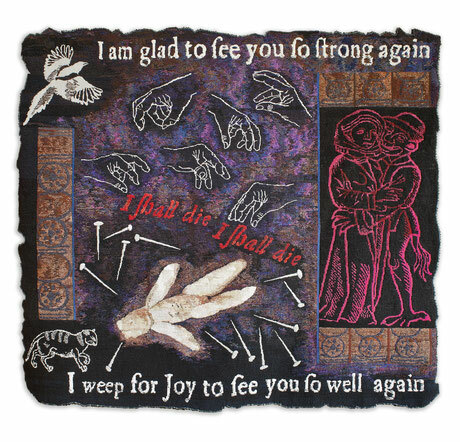 One of her accusers was Grace Thomas, whose testimony is illustrated in this tapestry. The texts are taken directly from the trial documentation. Grace said that Temperance fell to her knees and wept, upon meeting her one day, saying the words framing the tapestry. She claimed she was later subject to many persecutions. She said that Temperance came into her bedroom with the devil, and pinched her and stuck pins in her; that Temperance left a doll, or poppet, in her bed, that she turned herself into a cat, and that the devil in the shape of a magpie came to beat against her window.